“The Kramers” will be published in the first issue of Encounters Magazine next month. I wrote this story as a fiction resident at the Vermont Studio Center in January 2008 and have been looking for a home for it ever since. There is a genre, paranormal feel to the story that made it hard to place in most literary journals. 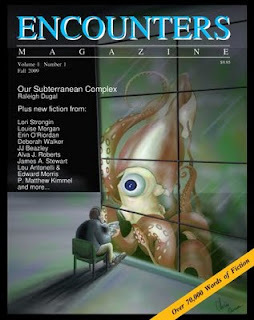 Needless to say, I am excited Encounters believes in this story and is putting it in their inaugural issue. I’ll post a link when the issue is available to order in November.